These German occupation stamps for the Eastern Command are overprinted Postgebiet / Ob. Ost, which is the abbreviation for the German Postgebiet Oberbefehlshaber Ost. In English this translates to Post Office Area for the Eastern Command. In 1914, the commander of the Eastern (Front) Command was General Paul von Hindenburg. In 1916, he was replaced as commander by Prince Leopold of Bavaria. These stamps were intended for use in Lithuania and South Kurland, and from 1918, also in Estonia, Livonia, and North Kurland. 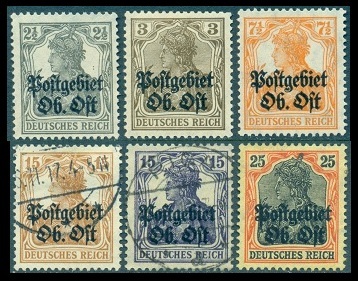 Eleven of the contemporary Germania-type definitive stamps and the 1 Mk. Berlin Post Office Representative-Subject-type definitive stamp were overprinted during 1916 and 1917 for use along the Eastern Front (Mi. #1-12, Sc. Russia #N1-12). Seven of them are shown in the images above. One might note that a couple of the stamps above have Riga cancellations. Riga, at that time, was a free city in association with the Duchy of Kurland. The Pfennig denominations come in various shades. The One Mark denomination comes with the usual perforation hole varieties for this period, 26 x 17 perforation holes, and 25 x 17 perforation holes. The variety with 26 x 17 perforation holes is much more expensive. Other denominations come with both glazed and matte overprints. For details on all the varieties of this issue, please refer to the Michel Deutschland-Spezial-Katalog Vol. I. For collectors, these "official" issues were all widely used, and most of them are relatively inexpensive today. Within the scope of the Eastern Command, there are also local stamp issues for Dorpat, Bialystok, Grodno, the German 10th Army, and the rather noteworthy ones for Libau. The prices of most of the local occupation stamps range from expensive to obscene, being from the hundreds to the thousands of Euros!